Increasing construction projects, rise in sale of vehicles, and growing urbanization buoyed the overall growth in power tools market of UAE. International events, particularly, World Expo 2020 in Dubai and developmental plans by UAE government such as UAE Vision 2021, Abu Dubai Vision 2030, would result in growth in construction sector especially, in retail and hospitality sectors; posting positive demand for power tools in UAE over the coming years. Electric tool segment generated majority of the market revenues due to its utilization in industrial, manufacturing and residential sector as well. According to 6Wresearch, UAE power tool market size is projected to reach over $163 million by 2024. The market registered a healthy growth in revenues during 2014-17, owing to surge in demand for metal and concrete segment power tools. Drilling cordless tools with lithium-ion batteries under the metal segment tool type are majorly in demand due to its deployment in residential sector along with construction and automation sectors. In UAE, the Northern region held majority of the UAE power tools market share on the back of increasing construction activities in Dubai due to World Expo 2020, increasing vehicle sales and urbanization. Southern region is expected to register a healthy growth during the forecast period 2018-24 due to increase in infrastructural and railway projects in Abu Dhabi. The UAE power tools market report thoroughly covers the market of power tools by tool type, technology type, verticals and regions. 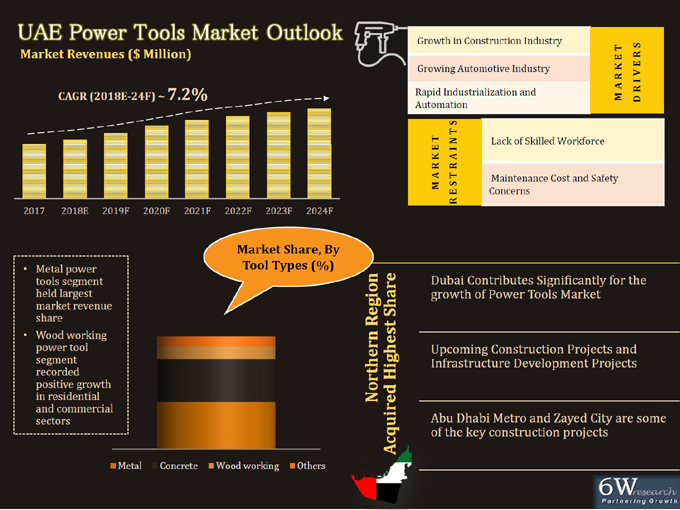 The UAE power tools market outlook report provides an unbiased and detailed analysis of the UAE power tools market trends, opportunities/high growth areas, market drivers, which would help stakeholders to device and align market strategies according to the current and future market dynamics.